‘Interface’ is a collaborative design research led by AP and Canterbury School of Architecture – Interiors. They present an installation during the Milan Furniture Fair in April holding information on their ongoing research in design practice. With their installation in Milan they present research in spatial design and design education exploring the subject of the interior through three main domains; first, the experience of space through intuition, emotions, and direct corporeal knowledge, second, the integration of the interior into a socio-cultural context, defining the interior as a place of intersecting social events and third, the substantiation of these aspects into real conditions, real as both propositional as well as actual. With the ‘Interface’ they appropriate an exploration of these aspects within a matrix of intersecting strands strategizing the perpetual negotiation between academia and practice aiming to build on the reciprocal relationship between design work and its procedural tactics. ‘Interface’ presents itself as an object in space describing its own formal tactics. With the primary aim to curate the surrounding space the object registers directional impact in the form of imprints or folds in its surface. The folds as physical distortions of a boundary appropriate interruptions in the movement around the object. Where these interruptions occur conceptual windows are placed as spatial diagrams, inscribed into the fold, providing the opportunity for an audience to enter notions of interiority. These conceptual windows could be described as autobiographical, recording their own presence as un-occupied space. Part of the University College for the Creative Arts, it is one of the UK's leading providers of specialist art and design education, offering courses in art, design, architecture, media and communication. 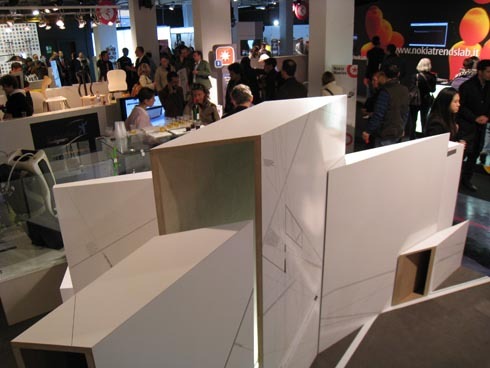 Interior Architecture & Design teaches the design of inhabited space, both private and public, in line with the changing definitions of temporality of social activities in contemporary culture.